This course takes radon testing to the next logical step in developing a considered approach to addressing radon concerns that have been identified during a building survey. Whether a survey involves a daycare facility, a school, or an administrative building, there is often a need, as dictated by the availability of resources versus the severity of the problem, to have a plan of attack. In recent years there has been a significant increase in radon surveys occurring in non-residential buildings such as schools, office buildings, apartments and even child care facilities. Addressing concerns in these types of buildings can be significantly more complex than dealing with single family homes. This added complexity is due to their size, and the additional factors associated with HVAC mechanical systems, non-owner occupants, communication plans, and long-term maintenance programs, not to mention budgets. Large facilities can greatly benefit from a well thought out plan for positive action that can save initial and long-term maintenance and have a positive impact on occupants. But if done improperly or haphazardly can create some ugly occupant relationships if not bad press in the media. 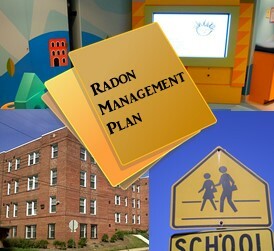 This program walks through the development of the elements of a long-term management plan to address validated radon risks in a manner that demonstrates a commitment to a safe environment without breaking the bank or creating wholesale panic. This course is designed for both radon professionals who want to expand their services in developing management plans as part of a mitigation strategy, as well as building owners who will undoubtedly be charged with executing such a plan. Ronald said: Great class and instructor. Scott said: Great job; still gets my heart rate up! Kenny said: Some topics would have different answers pertaining to Kentucky issues and we do a full blown diagnostic procedure on every commercial type facility, structures that are 25-30 years of age and older and slabs that are approximately 2000 sqft. and larger. and its a seperate service and fee. Scott said: Enjoyed this course,provided good info, would recommend. Thomas said: Very good supplemental materials. Tina said: The couse was timely as I am now conducting several radon surveys for schools, some of which show elevated radon levels. There is much misunderstanding among school administrators and maintenance staff as to interpretation of results and followup testing and the need for mitigation. This course answered many of those questions; Doug Kladder's expertise was demonstrated in the lecture and through the asnswers to questions asked by the class. Anthony said: Overall very good, with great practical information for anyone in the business! Greg said: I was surprised to learn quite alot that I did not know or was aware of, ,,especially about the variations in protocol. Jamie said: Great information as it gives more perspective on the different systems in buildings that affect radon levels. John said: Course material, content and presentations are excellent. Some of the test questions are somewhat ambiguous but overall very good. Theo said: The Course was very good. Really expanded my understanding. Michelle said: Excellent materials and Doug is a terrific presenter! There were times I wished I had experience with mitigation, HVAC or building construction. The course was challenging, however I enjoyed it! Thanks!! Jay said: Great course. Some of the content was a good refresh if you have taken the testing/survey in schools and large buildings. There was a lot of new content in this course that was very helpful and easy to obtain/understand. John said: As usual, a great course with easy to understand lectures and materials. Very useful. I learned a lot of new information about mitigating large buildings in this course Highly recommend! Michael said: I like all of your courses. They are easy to view and take. The only issue I have is when the students make a comment, it is very difficult to understand what they are saying. William said: Was another enjoyable and well taught radon class. Gustavo said: Excellent CE course. Content is right on target to deal with the complex issues of radon assessment in small and large buildings. As usual, Doug does a superb job of distilling complex scientific and technical issues into easily understood answers with plenty of practical illustrations from real world projects/situations. Greg said: Quick, informative, convenient, and useful way to obtain continuing education requirements. stacy said: Doug, you guys ALWAYS do a great job ! William said: Great class, will do again.